It is fully adjustable from 71 to 91cm (28 to 36"). 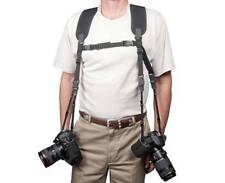 The Reporter Strap™ has quick disconnects on the primary strap so that using different connectors is a snap. 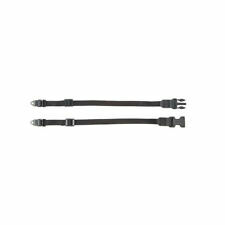 The popular OP/TECH USA 3/8" System Connectors™ are standard on the primary strap. 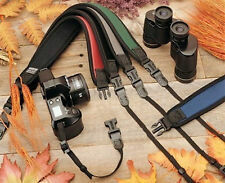 Strap Length Primary strap: adjustable 24"-51" (61cm–129,5cm). The weight is evenly dispersed while the strap functions as a shock absorber to eliminate neck and shoulder fatigue. 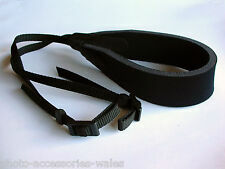 18mm webbing ultra strong strap. Colour: Black. The weight is evenly dispersed while the strap functions as a shock absorber to eliminate neck and shoulder fatigue. Pro Loop Strap™. Connection Type - 1/4" Webbing Loop. Carry Style - Neck, Shoulder. The weight is evenly dispersed while the strap functions as a shock absorber to eliminate neck and shoulder fatigue. Carry Style - Neck, Shoulder. 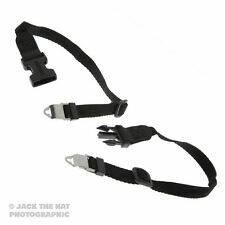 Op/Tech USA Pro Strap™ - 3/8". 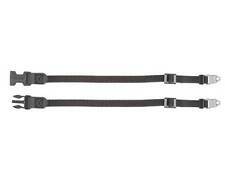 Strap Length - fully adjustable 24" to 51" (61cm - 129,5cm). The Pro Loop Strap has a unique connection system for especially tight connection points. 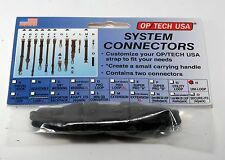 This easy-to-attach connection system is a great alternative to OP/TECH USA's patented connector. The weight is evenly dispersed while the strap functions as a shock absorber to eliminate neck and shoulder fatigue. Op/tech Mirrorless Wrist Strap in black #8201. The pad is made from soft, yet durable neoprene with a slide that tightens the strap snugly around the wrist for security and comfort. Keeping gear conveniently at hand while also guarding its security is a must for the active photographer on the go! Compatible with most binocular rainguards. It combines high quality neoprene, top grade leather and 3/8" (9,5mm) webbing to give you a simple, yet comfortable strap. Getting down to basics without sacrificing quality is what the E-Z Comfort Strap™ is all about. You can buy an extra set of connectors to customise the strap to best suit your needs. Another feature of the System Connectors is the small carrying handle created when the quick disconnects are latched together. 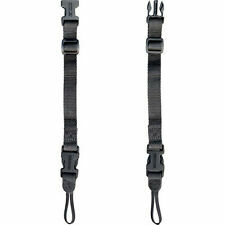 TheOP/TECH USA System Connectors (Set of 2) is a Uni Adapter Loop that is used to convert any OP/TECH neck/shoulder strap to the Uni-Loop quick-disconnect strap system. A small carrying handle can be created when the quick disconnects are latched together. Mamiya (except M645 Super & M645 Pro). The world famous Op/Tech Pro Strap. Fuly adjustable, lightweight, strong and durable. Breathable to prevent sweating. Op/Tech Super Pro B Strap. Supplied in BLACK. Contains one pair (one male and one female connector). Made in the USA. Op/Tech Pro Loop Strap - BLACK. Weight Reducing Strap. Loop Connectors. 1501372. The world famous Op/Tech Pro Loop Strap. Fuly adjustable, lightweight, strong and durable. Op/Tech USA Pro Loop Strap. Supplied in BLACK. Materials - Neoprene pad with Non Slip Grip™, nylon webbing and leather tabs. Connection Type - 3/8" Webbing. Webbing Width - 3/8". The weight is evenly dispersed while the strap functions as a shock absorber to eliminate neck and shoulder fatigue. 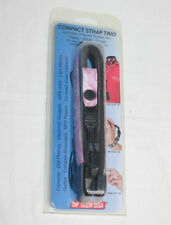 OpTech Fashion Strap 3/8" - Nature / Camo- Quick-Detach #1610252. The tailored design incorporates 'Comfort-Stretch' binding for added support. Easy to attach and fully adjustable from 75cm to 150cm. Optech Pro Loop Strap In Black. 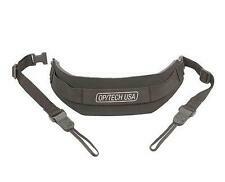 Optech Pro Strap In Black. The Pro Loop Strap™ combines all the features of the Pro Strap™, but has a unique loop connection system for especially tight connection points. Be prepared for the unexpected by always bringing along an OpTech RainSleeve! Includes 2 OpTech RainSleeves. Includes two OpTech RainSleeves. Suitable for both handheld and tripod applications. (20.3cm L x 11.4cm dia.). Optech Pro Strap In Nature Camouflage. The weight is evenly dispersed while the strap functions as a shock absorber to eliminate neck and shoulder fatigue. Stays in place with our Non Slip Grip™. Made in the USA. Optech Pro Strap In Red. The weight is evenly dispersed while the strap functions as a shock absorber to eliminate neck and shoulder fatigue. Stays in place with our Non Slip Grip™. Made in the USA. OP/TECH USA SOS-Curve Strap for bags, briefcases and luggage- neoprene "Nature"
For bags, briefcases and luggage- neoprene (Nature). Comfortably carries heavy bags, briefcases, computer bags and luggage. It's the perfect strap for heavy bags and cases. Slightly curved neoprene pad stays securely in place with our Non Skid Surface and allows the strap to rest more securely on the shoulder. Product Code: 8463. You can buy an extra set of connectors to customise the strap to best suit your needs. Another feature of the System Connectors is the small carrying handle created when the quick disconnects are latched together. Fasten Together for Carry Handle. 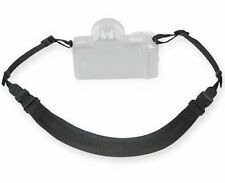 Loop of 1/4" tubular nylon webbing fits tight connection areas. Fits Tight Connection Areas. One Male and One Female QD. The world famous Op/Tech Pro Strap. Fuly adjustable, lightweight, strong and durable. Breathable to prevent sweating. Op/Tech USA Pro Strap. Supplied in BLACK. The world famous Op/Tech Pro Strap. Fuly adjustable, lightweight, strong and durable. Breathable to prevent sweating. Op/Tech Super Pro A Strap. Supplied in BLACK. 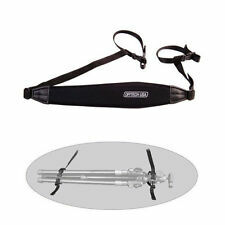 The Mirror-less Sling can be worn on the left or right shoulder. When attached properly, the strap will be out of the way when in the shooting position. Be sure to make it part of your essential gear! S4080 S4200 S4300 S4400 S4500 S4530 S4800 S4850 S4830. For FUJI, FUJIFILM, FUJI FINEPIX. NEOPRENE NECK SHOULDER STRAP. Internal Material : Soft Neoprene Padding With Anti-slip Weave, Black. Outer Fabric: Soft woven hardware neoprene. The Grip Strap has a soft, durable neoprene pad that is adjustable. 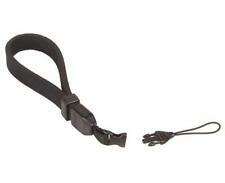 OpTech 6701242 Grip Strap Black. This leaves a 3/8" webbing connection for the third connection area. 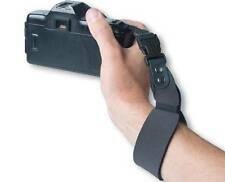 Enables a hand grip option without interfering with a neck/shoulder strap.